DAFC are planning tributes to mark the anniversary, and the Dunfermline matchday programme will also contain numerous articles on the man in the Airdrie United issue on the 7th January. Here we take a look back at Norrie`s Dunfermline career. Born on the 23rd March 1961, Norrie McCathie`s football career was ambling along without too many headline writers taking notice. Having played for, and scored an impressive 36 goals for Edina Hibs, he signed for Cowdenbeath in 1980. Then Cowden manager Pat Stanton had paid the princely sum of £350 for the young striker. When Stanton moved along the Cuddyhouse Road to Dunfermline Athletic in December 1980, McCathie quickly found his opportunities limited by new manager (and former Par!) Andy Rolland. With Dunfermline entering season 1981/82 having narrowly avoided relegation the season before, Stanton needed to freshen his squad for the challenge ahead. With the season already having just started on a gloomy note, a 2-0 League Cup defeat at Hamilton, an unremarkable swap deal took place bring McCathie along to East End Park. Craig McFarlane, who had played 27 games for Dunfermline and scored just 3 times, made the reverse move to Cowdenbeath and Norrie McCathie`s Dunfermline career started on the 10th of August 1981. His debut followed a few weeks later, at Ayr United. Another milestone was reached by McCathie on the 17th of February 1982, his first goal for the club. He got the decisive second against Queens Park after Rab Stewart scored the first. A brace was to follow against Queen of the South the next week, but his goal scoring exploits were to be over for the season after that brief flurry. Pat Stanton resigned from his post of Dunfermline manager at the start of the 1982/83 and the remarkably unsuccessful Tam Forsyth took over. 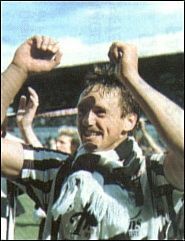 Forsyth consigned McCathie to a spell in the reserves, which is perhaps a perfect reflection on his Pars managerial career, though he did eventually restore him (to the midfield) as an almost inevitable relegation down to the bottom flight occurred. A 29 year old rookie manager by the name of Jim Leishman took over from Forsyth, and McCathie soon became a regular in the starting line up. By now a "Mr Versatile" McCathie saw his appearances range from centre half to centre forward on occasion, filling in wherever others were posted injured or suspended. When the ultimately unsuccessful promotion bid of 1984/85 fell at the final hurdle, McCathie found himself alongside both Grant Jenkins and John Watson in an attacking line up. McCathie grabbed nine goals that season, a career best. 1985/86 saw McCathie win the second division, part of only the second Dunfermline team to do so in the club`s history. The McCathie/Young partnership was not out of its depth in the first division, far from it, as the club once again won a promotion this time into the Premier League for the first time. 1987/88 season was a struggle for a team that had been in the bottom flight just over a year before. Players such as McCathie & Young, Ian Westwater, Bobby Robertson, John Watson, Grant Jenkins, Steve Morrison and many more had achieved so much in such a short period of time. Full time football was now on the agenda and Norrie was one of the few who managed to adapt to the huge change in life that came with it, eventually. An injury kept McCathie out of the team for a prolonged period, for the first time in years, at the start of 1988/89 season. Grant Tierney came in as a replacement and performed very solidly throughout his stay. A brief spell away from East End Park even saw McCathie pull on an Ayr United jersey for four matches on loan! The sebatical would not last long however and a fully fit McCathie was soon restored to the Dunfermline defence. As centre half, he was part of the team that won the 1st division for the first time in Dunfermline`s proud history in 1989 and he once again took on the challenge of playing in the top flight. Flair players were added, including Istvan Kozma of course, but McCathie was to remain one of the first names on the team sheet every single week. Jim Leishman left the club in the summer of 1990, and Ian Munro took over in well documented circumstances. McCathie allegedly took the news with his custom wit shouting out to Leishman "See I told you I`d see you out the door!" A testimonial match was awarded for 10 seasons service, with Newcastle United the opposition. Jocky Scott soon took over, and it was in his first week as manager that yet another iconic McCathie moment took place. Having been tied at 1-1 after full time and extra time in the Skol Cup semi final with Airdrie, McCathie strode up to confidently place his decisive penalty past John Martin to ensure Dunfermline qualified for their first cup final since 1968. McCathie became very proud to lead the Dunfermline team out into that cup final, though the 2-0 defeat to Hibs became a clear anti-climax. As with Munro, Scott did not stay in the job for long and Bert Paton became the sixth manager that McCathie played under at Dunfermline Athletic. Having long since been appointed team captain, McCathie missed just a handful of games during his time under Paton`s management. There were so many outstanding performances during that era, it is impossible to list them all. Highlights included the 4-4 draw at Dens Park that was almost single handedly pulled back from defeat, numerous last ditch goal saving tackles, spurring the team on whenever heads dared to start going down and so many more. With promotion attempts failing under numerous guises in the mid 1990s, McCathie became even more determined to see the club back up in the top flight before he was forced to eventually hang up his boots. That opportunity was denied to him when he suddenly passed away on that January morning 1996. The tributes paid to the man at the time, and since, are testiment to an incredible player and man who was a club legend long before his untimely death. The memorial service held at East End Park, as well as that first football match to be played after his death, were fitting tributes to a huge character. His legacy lived on within both that 4-3 win over Clydebank and the remainder of the season that saw his beloved Dunfermline finally back in the Premier League. Rest in Peace; Norrie McCathie 1961-1996. A man never to be forgotten.